When you visit Trent Bridge, you’ll be visiting a venue that’s been voted the best spectator experience in the country by cricket supporters for eight years in succession, and holds a TripAdvisor Certificate of Excellence. Trent Bridge is packed full of family entertainment to satisfy children of all ages – from babies to teenagers. 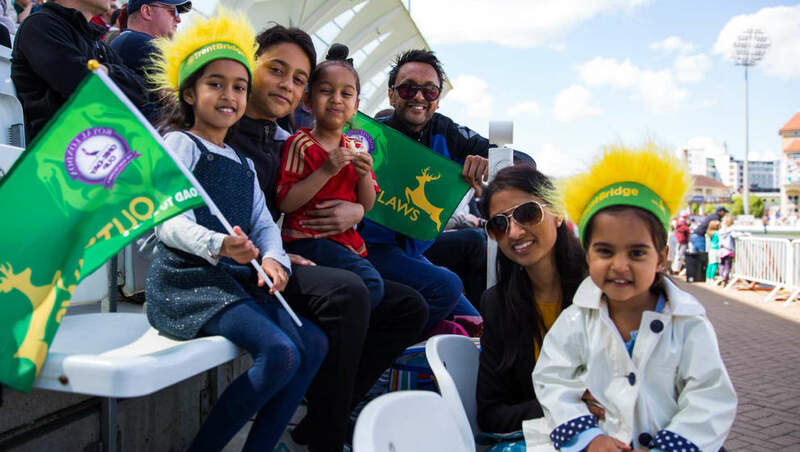 William Clarke Stand: Outlaws Family Zone - this stand is now Trent Bridge's designated alcohol-free family zone for T20 cricket and you'll find this stand nestled between the Radcliffe Road End and the Smith Cooper Stand. Within this seating area, there's plenty to keep children entertained, with free face painting, glitter tattoos, a magician, a balloon modeller and regular visits from our mascot, Nuts the Squirrel (entertainment is subject to change). In the Trent Bridge In Courtyard collect your NatWest T20 Blast/Notts Outlaws giveaways and visit the Batfast Cricket Simulator and the Outlaws Cricket Zone, where children can take part in batting, bowling and fielding exercises. Strike your best batting and bowling poses in front of our photo opportunity areas at the back of the William Clarke Stand, opposite the back of the Trent Bridge Inn. Visit our face painter and bouncy castle, as well as our crèche staffed by qualified and experienced nannies in the Squash Courts, accessible via the Ticket Office. There you will find a variety of crafts and toys to keep little ones entertained. After the match, the entire Outlaws team will sign autographs at the front of the Pavilion on the outfield shortly after close of play. Remember to bring along your 'My Heroes Autograph Card' and collect all the players' signatures. Look out for our pyrotechnics displays, which we use to celebrate the Outlaw' boundaries and wickets. Keep your eyes peeled for our friendly mascot, Nuts the Squirrel, who will be taking in the match from various areas around the ground and will be delighted to pose for photographs and sign autographs. We have plenty of family facilities to make your trip hassle-free - click here to find out more.